The sterilization of laboratory equipment is very necessary. 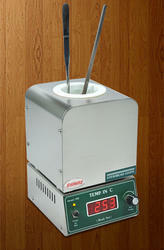 Keeping into mind this necessity, we are offering Laboratory Glass Bead Sterilizer. Produced to meet international standards our Glass Bead Sterilizer is fully insulated and designed for heavy-duty operational schedules. Quick and easy digital temperature display makes it an alternative to conventional methods of sterilization. It is very safe and convenient to use. We provide full customization as per client’s requirement that too at most reasonable prices. We are Majorly Dealing in Exports only. Glass bead sterilizer is very convenient to use over Alcohol/flame for sterilizing implements like forceps, scissors, scalpels etc in the laboratory. It takes just 10 seconds to sterilize an instrument. It ensures total sterilization by the destruction of all microorganisms in seconds. It is ready to use in 45 minutes from cold start. It is available in 3 sizes. All same except the crucible size is different. The instrument is supplied with 500 gms of glass beads. Looking for Glass Bead Sterilizer ?